In-depth exploration of the Marketing Automation software market. Key trends to be aware of in 2016 and factors for success with MA. Top Rated tools for Small Businesses, Mid-Sized Companies, and Enterprises. Detailed profiles of 20 MA platforms, including pros & cons as cited in 1,647 end-user reviews. Common capabilities and key factors to consider when selecting Marketing Automation software. 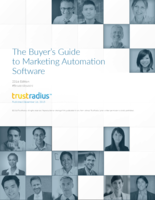 TrustRadius is excited to publish our second edition of the Buyer&apos;s Guide to Marketing Automation Software. 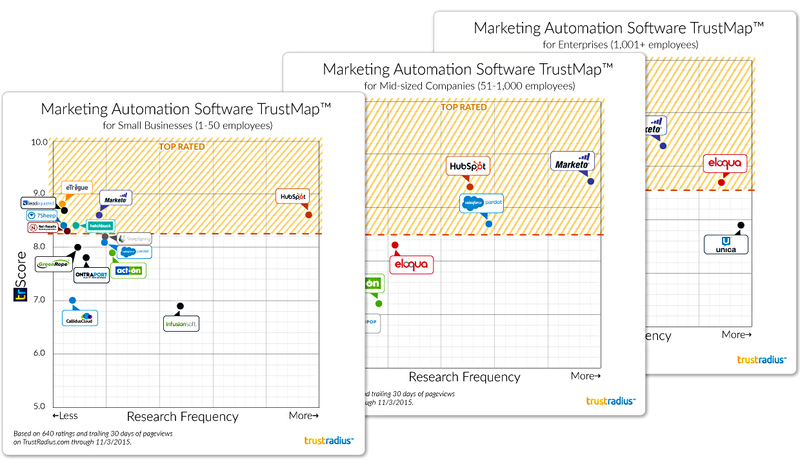 The updated guide is a distillation of 1,647 ratings and in-depth reviews of 20 leading Marketing Automation (MA) software products on TrustRadius. All ratings were contributed by authenticated end-users, and many were written or updated in the last year. We believe that the most useful insights come from first-hand users, particularly in a category like Marketing Automation, where ease of use and sophistication of feature-set are equally important and at times in conflict. As always, each reviewer was vetted and validated by a TrustRadius team member. The result is a reliable, independent analysis, uninfluenced by vendors or anyone else with an agenda. In this updated 2016 edition, we&apos;ve also moved away from simple rating averages to the trScore, which is a weighted average that factors in review freshness, review source, and rating type, in order to accurately represent current customer sentiment. The trScore levels the playing field among vendors, and removes the positive bias that results from vendors inviting only known promoters to review them. In addition to reading and distilling every single review, we spoke with vendors and experts to offer differing viewpoints on 2016 trends in marketing automation. As with our other buyer&apos;s guides, we hope this report will help you select the Marketing Automation software that best fits your needs. This guide covers 20 Marketing Automation products, 8 new to the 2016 edition, not all of which have precisely the same feature set. Some vendors offer a one-size-fits-all or sliding-price package; however, many vendors focus on a particular niche or segment. Typically, MA solutions allow users to create, automate and track campaigns—but the campaign scale, channel(s), complexity and degree of automation vary from product to product, as do the required skill sets. While some tools are designed for tech-savvy power users or companies with in-house IT support, others are designed for smaller companies with fewer technical resources. Usability has been a pain point for Marketing Automation—across the category, usability, performance, and support are the attributes that receive the lowest ratings. This year we&apos;ve seen easier to use tools quickly gaining traction, especially in the SMB sector (which vendors and experts have identified as a major growth opportunity for MA vendors). We&apos;ve also seen developments in analytics, integration with sales, and content personalization. Company size, industry and use case continue to be important factors in determining the best-fit solution. In addition to traditional Marketing Automation features, some products included here also contain significant Customer Relationship Management (CRM), Marketing Resource Management (MRM), eCommerce, Predictive Analytics, Sales Intelligence, Cross-Channel Campaign Management, Content Marketing, and/or Content Management capabilities. The dividing line between these categories is blurring as vendors make acquisitions and establish partner ecosystems, striving to offer a complete range of capabilities under one roof.